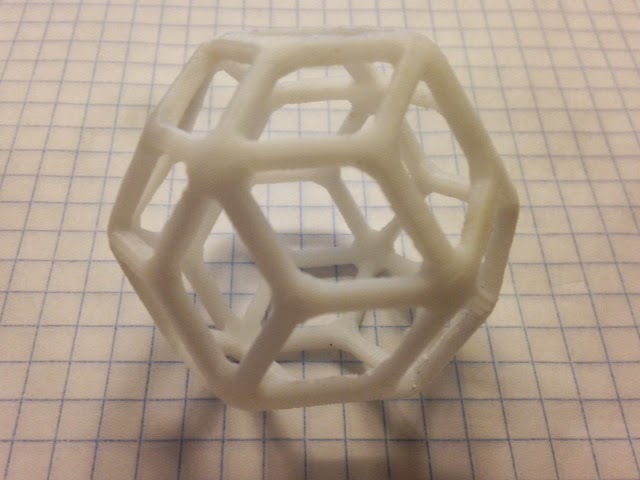 This Catalan solid is the Rhombic Triacontahedron, the dual of the Icosidodecahedron (which we've already printed twice before as a snap-together model, in Day 89 and Day 117). Settings: .3mm/low on an Afinia H-Series, with the support density reduced to 2 layers in order to make the supports easier to remove. Technical notes, build platform flavor: This was my first print using Afinia's Borosilicate Glass build plate and BuildTak Platform Surface. Both worked wonderfully, with the glass seeming to get much hotter all the way to the edges than the usual Afinia perf board, and the BuildTak providing the necessary adhesion (although it itself is not sticky, just rougher than the glass). I do need to find some larger binder clips, however, because mine are a bit too small to hold this new setup in place. I'll do a "print to the edge" test on the glass+BuildTak combination later this spring. Technical notes, filament flavor: This model looks snowy white because of the great matte colors you can get with ABS, especially the Afinia Premium. Most of the PLA filament I've used is a bit too shiny for my taste, with the exception of MakerBot's wonderful translucent PLA filament colors. If you're looking for a matte PLA then the best I can recommend is MakerBot's "Warm Gray", although they are currently out of stock for the Replicator 2. However, you can order it for the 5th-gen Replicators and it will be the same filament, just on a thinner and taller spool that looks somewhat like a film reel. You can't use the 5th-gen spools on the Replicator 2 but you can rewind the filament onto an old-style MakerBot spool or use a separate filament stand. UPDATE: The Rhombic Triacontahedron wireframe is the shape made by Roger vonOech's StarBall puzzle, which I just bought from Robert Fathauer's lovely shop at G4G11.